I usually blog about our book club selection on the day we have our meeting, but I posted Workin' it Wednesday yesterday. So I am writing about it today! 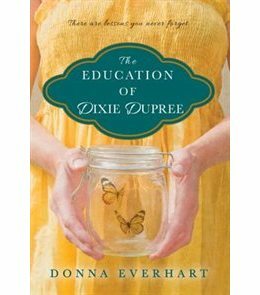 This month we read The Education of Dixie Dupree by Donna Everhart. This book is the story of a young girl in Alabama and what happens in her life between age 8 and 11. I typically love any book set in the South but I did not like this book at all. I was just going to stop reading it halfway through, but instead I just skipped to the last couple of chapters to see how it was all resolved. I usually don't give away any plot points but since I'm not recommending this book then I will here (so Spoiler Alert, stop here if you want to read this book). The story is tough to read and I didn't think it had any redeeming qualities that appear in other books I've read with difficult topics. You know right away that she will be sexually abused by her uncle because it starts with the lawyer taking her diary where she would have catalogued the abuse. The abuse is told with alarming detail and I did not like reading it at all. As if that wasn't bad enough, there are a few episodes where her mother beats her and almost chokes her to death. Plus her dad tries to commit suicide and then ends up in a coma and Dixie and her brother aren't told anything about where their dad is or what happened to him, although they know he's in the hospital. I know it was a different time (1960s) but it drove me crazy that the adults didn't tell the kids what was going on. At the end it is revealed that this uncle had also sexually abused the mother and is the actual father of Dixie's brother. I had this figured out pretty early on and it annoyed me even more that the mother would let this guy come to their house, knowing what kind of guy he is, and then let him be alone with her daughter. She tries to explain why this happened at the end of the book but I couldn't forgive her. One of my favourite authors is Ann Marie McDonald, and I loved Fall On Your Knees. This book also deals with abuse and poverty but the quality of writing countered the scenes that were difficult to read. The Education of Dixie Dupree did not have this. I know what the author was trying to do, she was trying to make the mother, father, Dixie, and even her uncle multi-dimensional characters with their own motivations for their actions that maybe we could understand, but I don't think she was successful in that attempt.